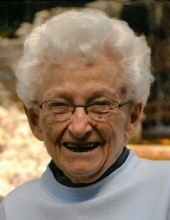 Luella J. Hanke-Soerens, age 92, a resident of Pine Haven Christian Home, passed away peacefully on Monday February 4, 2019. She was born September 20, 1926 in the Town of Lima, a daughter of the late John and Evelyn (Eernisse) Prinsen. Luella attended school in Sheboygan Falls and was a graduate of Sheboygan Falls High School, Class of 1944. Luella was united in marriage to Merlin Hanke on October 21, 1944. He preceded her in death on July 23, 1995. After marriage, Luella had been employed at the Krier Canning Company and the H.C. Prange Company. After Merlin’s retirement, the couple provided janitorial services to Faith United Methodist Church in Sheboygan Falls, and enjoyed their time in their RV with their Good Sam camping club. The joy of Luella’s life was attending local auctions and flea markets. Wilton Dell “Pete” Soerens and Luella Hanke were married on April 26, 1996. He preceded her in death on November 30, 2002. As a resident at Pine Haven, Luella enjoyed the various activities offered such as Bingo, Crafts and Dominoes with her many friends. She was a faithful member of First Reformed Church of Sheboygan Falls. Surviving Luella are three sons: Dennis (special friend Luella Landwehr) and DuWayne (Dorita), both of Sheboygan Falls, and Dean (Brenda) of Howards Grove, three step-sons; Steven (Joan) Soerens of Houston, TX, Thomas (Joellen) Soerens of St. Charles, IL and Russell (Elizabeth) Soerens of Perkasie, PA, a step-daughter, Diane Jean (Ted) Schroeder of St. Peter, MD. Grandchildren; Dorene (Dmitri) Thompson, of Henderson, NV and Donovan (Tineke) Hanke of DuPont, WA , Jacob Van Engen of Howards Grove, three great-grandchildren; Anora, Jaren and Amberly Hanke, as well as step grandchildren and step great grandchildren, one sister, Dorothy Boeldt of Sheboygan Falls. A Funeral service will be held on Monday February 11, 2019 at 6:00 p.m. at Zimmer’s Westview Funeral & Cremation Care Center. The Reverend Brad Veenendaal will officiate. Luella will be laid to rest next to her husband Merlin at Saron Cemetery in the town of Sheboygan Falls on Tuesday, February 12, 2019 at 9:00 am. Friends may call at Westview on Monday from 4 until the time of service. A memorial fund has been established in the name of Luella Hanke-Soerens. Luella’s family would like to express their thanks to the staff of Pine Haven, and Campassus Hospice for the loving care Luella received as a resident. To send flowers or a remembrance gift to the family of Luella J. Hanke-Soerens, please visit our Tribute Store. "Email Address" would like to share the life celebration of Luella J. Hanke-Soerens. Click on the "link" to go to share a favorite memory or leave a condolence message for the family.